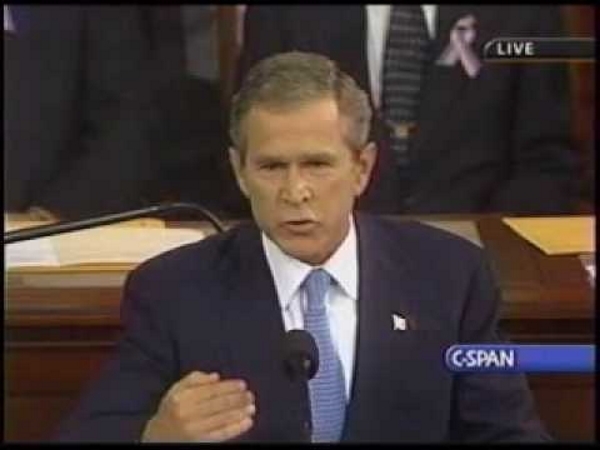 President George W. Bush speaks to Congress, Sept. 20, 2001. He said the right things, but failed to do them. Yesterday’s post may have exhibited some frustration on my part. As well it might! Since at least 2001 the Western world has been in a life-and-death struggle with the movement that brought us yesterday’s bloodbath in Paris, as well as countless less publicized atrocities (less publicized because they took place in Nigeria, Iraq or Syria to people the West doesn’t care about as much, although they were often worse). Despite everything, there is still no unified effort to fight back in the name of civilization. We will starve terrorists of funding, turn them one against another, drive them from place to place until there is no refuge or no rest. And we will pursue nations that provide aid or safe haven to terrorism. Every nation in every region now has a decision to make: Either you are with us or you are with the terrorists. This is not, however, just America’s fight. And what is at stake is not just America’s freedom. This is the world’s fight. This is civilization’s fight. This is the fight of all who believe in progress and pluralism, tolerance and freedom. We ask every nation to join us. Unfortunately, the US didn’t do what Bush promised. Bush’s coalition didn’t catch Bin Laden in Afghanistan and then unnecessarily invaded Iraq, compounding the error by taking the country apart and handing it over to the Shiite militias, strengthening Iran and provoking the vicious civil war that gave birth to Da’esh, the “Islamic State.” Its counter-terrorism activities focused narrowly on Al Qaeda, ignoring the greater (albeit longer-range) threats from Iran and Hizballah. Resources were squandered on “homeland security” that was meaningless. And then came Obama, who took the side of the Islamic radicals of the Muslim Brotherhood in Egypt, tried to form an alliance with Iran (in pursuit of which he is permitting the regime to acquire nuclear weapons), allowed himself to be deterred from following through on his threats against mass-murderer Bashar al-Assad, and carried out a consistent policy to create a terrorist state next to Israel’s population centers. Israel, the strongest force standing against the jihad in the region! In the meantime, a form of Orwellian doublespeak has been enforced in America, where it has been made unacceptable to speak about the Islamic roots of the terrorism that is daily killing dozens of people around the globe. Political correctness is more important than a straight answer, and official pronouncements seem to be made underwater. “But what can we do? We can’t fight all 1.5 billion Muslims.” As if we needed to! Most of those 1.5 million Muslims don’t care about ideology or politics, or even much about religion. Most of them live barely above the subsistence level, and others who have better lives aren’t interested in losing them. Radical Islam is not a grassroots movement, despite what their leaders would like us to think. Jihadists are assembled, paid, equipped and led by governments, organizations of all kinds, and elites. What we, the civilized world, needs to do is to focus. To learn to understand the nature of the beast that we are confronting. To chart the organizations that support it, name the leaders, determine the governments and factions that provide its nourishment. And then we have to crush those organizations, kill the leaders and elites, and overthrow those governments. This would require an allocation of resources up front, in the intelligence phase. There would have to be unprecedented agreement between the targets of the jihad, an ability to work together despite their differences (think of the Allies in WWII). There would have to be a unity of purpose, an understanding of what has to be done and why. I am pessimistic that the unity of purpose can be found. Europe is still committed to the ideal of multiculturalism that is eating its heart out while it pretends that nothing is the matter, like the Spartan boy who stole the fox. America is immeasurably weaker today than it was in 2001, thanks to Bush’s bumbling and Obama’s ignorance and ideological obtuseness. In addition, it would take a leader, someone like Winston Churchill, someone who could take the very hard decisions that would be needed while still retaining the vision of justice, tolerance, freedom and openness that characterize the ideal Western society that is, after all, the ultimate goal. Probably the leadership will have to come from America, despite its weaknesses and despite the ideological drift toward a European-like impotence. I must admit that I don’t see it on the horizon. It would be a struggle, but — by orders of magnitude — nothing like the struggle to defeat the Axis in WWII. Even so, I don’t know if the West has the fortitude for it. I will be watching with vital interest from here, the front line in the war. This entry was posted in Islam, Terrorism. Bookmark the permalink. I had just finished writing a letter to my son that sounded all the same notes as your article, moments before I read your piece. Even down to the reference to the missing Churchills! It must be in the air, as he had been asking me about the French atrocity and a vociferous rejection in the commentary of a Nicholas Kristoff apologia for Islam that he had been reading. Perhaps he wanted me to acknowledge some improvement in public discourse, by the fact that so many disregarded the ‘Islam is the religion of peace’ defense. I disappointed him again, unfortunately. The media, academia and our leaders count on our short attention span. With constant distraction, it’s very difficult to summon the will to fight the creeping civilizational jihad. But it does seem that the leadership role to combat this will fall to America again. Europe is not a source of moral and political wisdom, constant or otherwise. But America is still a Christian nation, and none of this spectacle of cultural-suicidalism of the Swedes, the entrenchment of Islamic Jew-hatred in France by Muslim immigrants in the politics of the place, nor the general defamation of Israel that passes for domestic policy in Spain and England and most all the other EU nations… none of that can get a grip here if the culture asserts itself. Al Sharpton may escape a comeuppance by standing next to the President for his assault on the culture, but there is not enough acceptance of his m.o. by the general public to withstand the effort to defend America. Same for Holder and the President himself. Without their collusion, even the media would have had to call out the President. Holder and the media made it easy for the President to resist common sense and the public’s wrath and weaken the inclination to resist the totalitarianism of Islam. That fortuitous circumstance is disappearing. Even without the debacle of allowing Iran to get a bomb, President Obama will forever be known as the worst President this country has ever produced, and that will help raise up the alarms countering the creeping jihad. And American will act. I note the title uses the word “civilization” and the intro para “Western world”. President Bush43’s Congressional address did the same. The trends clearly show it is to be EASTERN civilization that prevails. Recall that Reverend Khomeini was living in Paris before the Elsee Palace arranged for him to return to Teheran. Recall that the US sent $7 Trillion to the Arab oil barons. Recall that the US has (soon: had [past tense]) a welfare state with its security establishment in decay (Think of Valarie Blame). After WWI, Oswald Spengler wrote a book titled THE DECLINE OF THE WEST. What happened in Paris a couple of days ago was as predictable as the phases of the Moon and tidal charts. The term “Boca Raton Bolshevik”, coined by US national commentator Dr Michael Savage, explains, at least to me, where all the resources are being drained off to……with little left to confront the newest version of the Barbary states and pirates. Muslims won’t be taking over Europe. The National Front and Golden Dawn will see to it. All this is less about the imported barbarians and more so about the failed welfare states of Europe. The NY Post writer must accept that current and future US public budgets won’t easily support chartering ships and aircraft for evacuations. The US is closing down it’s FDR-era welfare state. Vic, the outlook in the U.S. is not as bad as all that. Consider what just happened in the ’14 mid-term elections. Granted, Israel is still the front line of defense against the Islamist menace…but Obama just signed into law the U.S.-Israel Strategic Partnership Act of 2014. He may not have wanted to do that, but in the face of overwhelming Congressional support, he had little choice. Consider what just happened in the UN. On the eve of the vote, I was personally very worried that Obama would allow that wretched PA resolution to pass, given the all but total media blackout and the rush to vote while the U.S. Congress was in recess. But here Obama had a clear shot to screw Israel, and he didn’t do it. Did he want to? Probably…but when Senator Lindsay Graham – the incoming Chairman of the Senate Foreign Relations Committee – threatened that if that passed, Congress would de-fund the UN, I think Obama wisely decided not to spend what little political capital he has left fighting Congress over Israel. Bottom line: Obama may still have two years left to do what damage he can, but his worldview is on the way out here in the U.S. Just about every serious contender being talked about on the GOP side of the aisle for POTUS in ’16 promises to bring a far more assertive stance against Islamism to bear. There is light at the end of the tunnel. Increasingly, I don’t think it is a train.